The principles of adaptation to various environments have not yet been clarified. Furthermore, autonomous adaptation remains unsolved and a seriously difficult problem in robotics. Apparently, the adaptation ability shown by animals and that needed by robots in the real world cannot be explained or realized by one single function in a control system and mechanism. That is, adaptation in motion is induced at every level in a wide spectrum from the central neural system to the musculoskeletal system. 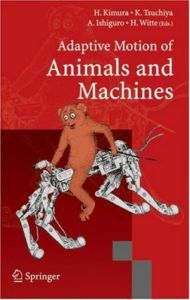 This book contains the papers selected carefully from the symposium AMAM2003 particularly concerning adaptation in locomotion from the viewpoint of robotics and neurophysiology. Due to this restriction in topics adopted, we expect that this book will efficiently provide good information for scientists and engineers, which is useful to discuss the principles and mechanisms underlying animals' adaptation under unstructured environment .